When Did ‘The Arsenal’ Become Just ‘Arsenal’? This is a question that often comes up among Arsenal fans. We like to think our club is special because we can call it ‘The Arsenal’, unlike plain old Liverpool, Manchester United and Chelsea. But when did we stop officially being ‘The Arsenal’? Well the short answer is: we didn’t. The club is as much ‘The Arsenal’ now as it ever was. It’s well known that Arsenal spent their early years as the works team of the Royal Arsenal at Woolwich, and so named themselves after their place of work. Arsenal are believed to have been officially formed as a club on 1 December 1886, probably at a meeting in the Royal Oak public house in Plumstead. They played their first game on 11 December, which may have been under the name of Dial Square – the section of the armaments factory where about half of the founding players worked – but there’s little firm evidence of what name was used. The name Royal Arsenal was officially adopted on 8 January 1887 at a players’ meeting after the club’s second game, held on that day. The new club’s result was reported in the local paper as Royal Arsenal 6 Erith 1. Royal Arsenal Football Club was the name used for the next six years, until May 1893. In this year the club was faced with large rent increases on their ground, so instead decided to form a limited company and issue shares to finance the purchase of a ground. The original Woolwich Arsenal Football and Athletic Company Limited was formed on 2 May 1893, with the word ‘Royal’ being dropped as it was not allowed to be used by a corporation. In 1913 the club moved to Highbury. This is the part of the story where things seem to become less certain: did Woolwich Arsenal officially become The Arsenal, and if so when, and why and when did they drop the ‘The‘? The facts of the club’s official name changes in this period are actually very certain, for the simple reason that all name changes of limited companies have to be approved and then held in records at Companies’ House. 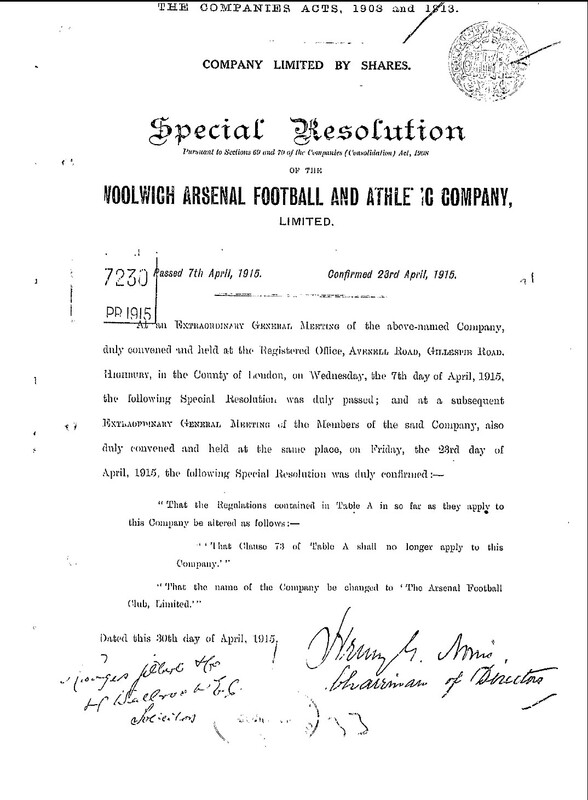 The first record is the Certificate of Incorporation for company number 109244 dated April 26, 1910, under which the Woolwich Arsenal Football And Athletic Company Limited was registered. This was after the club had gone into liquidation and reformed as a new company. Three years later the club made the move to North London and severed all physical links with their original home area of Woolwich. Obviously it was no longer appropriate to be known as Woolwich Arsenal, though there was not an immediate change. 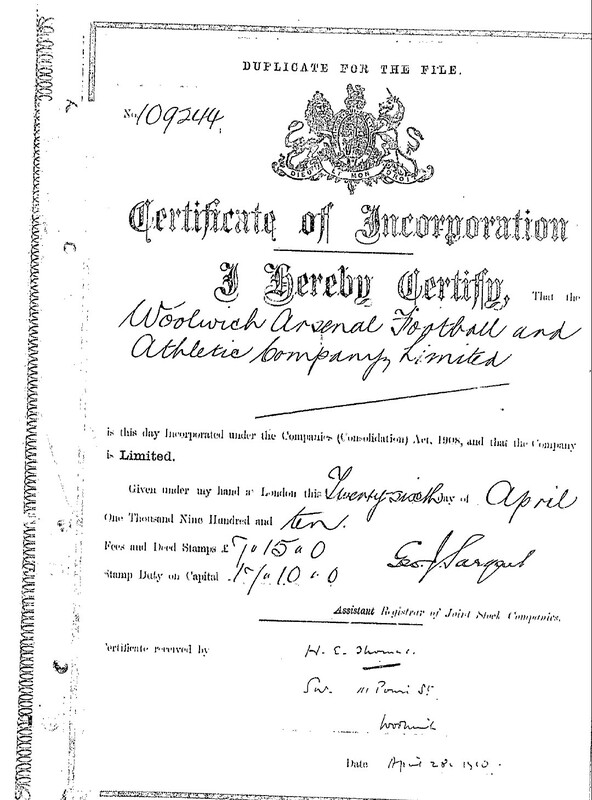 Club literature points to the start of the 1914-15 season as the time when the Board decided to drop Woolwich from the name, and refer to themselves as The Arsenal Football And Athletic Company Limited. However, at this stage the official name had not been changed. 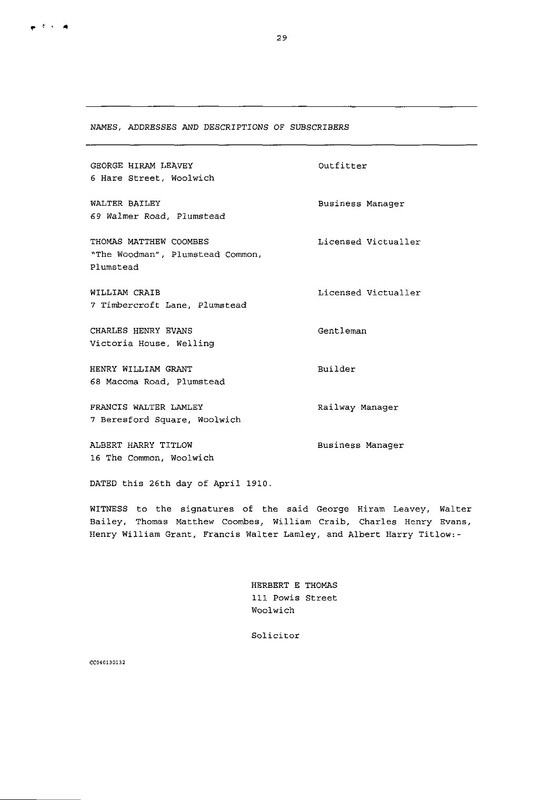 The next documentation from Companies’ House is in fact a notice that a special resolution of the club was passed on April 7, 1915, to change the club’s name. This advised that the name would henceforth be quite simply The Arsenal Football Club Limited. The words Woolwich, Athletic and Company were all removed in a single step. For completeness, we can also see that at the same time a resolution was passed that ‘Clause 73 of Table A’ would no longer apply. Table A is the standard Articles of Association that apply to companies unless they state otherwise. If I’ve checked the correct version of Table A, ie the one in force in 1915, then removing this clause meant that directors were no longer limited to borrowing only up to the amount of share capital issued. Possibly additional borrowing was needed to complete the stadium at Highbury, especially given that the First World War reduced crowds and then cancelled league football altogether. 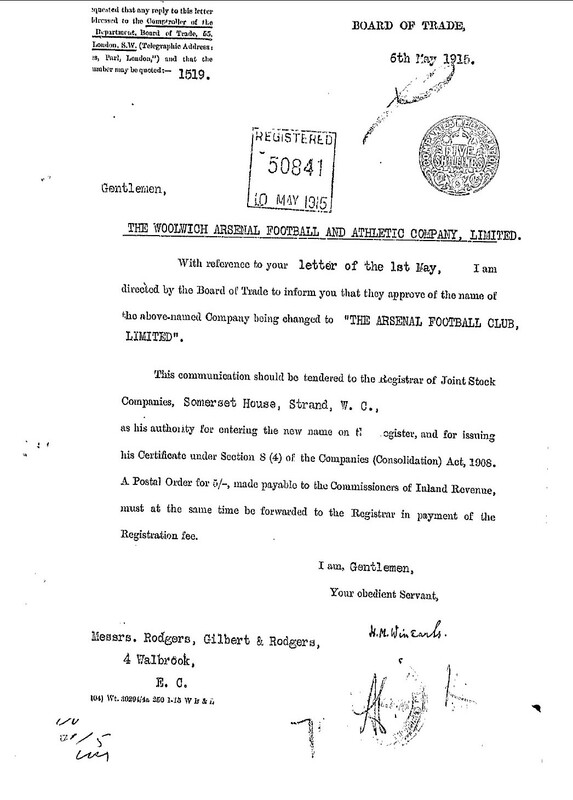 The confirmation of the name change taking legal effect can be seen in the following two documents: a letter from the Board of Trade (I assume addressed to Arsenal, though this is not entirely clear) telling them they must advise the name change to the Registrar of Joint Stock Companies, and a certificate to prove it. These appear to have been sent at different times, with the certificate itself dated May 13, 1915. The certificate is interesting in that the all-important ‘The’ is part of the standard printed text, so it doesn’t appear that it was any deliberate decision to call the club ‘The Arsenal’. Either way, the official name then remained The Arsenal Football Club Limited until 1991, when the club was reregistered as a PLC. 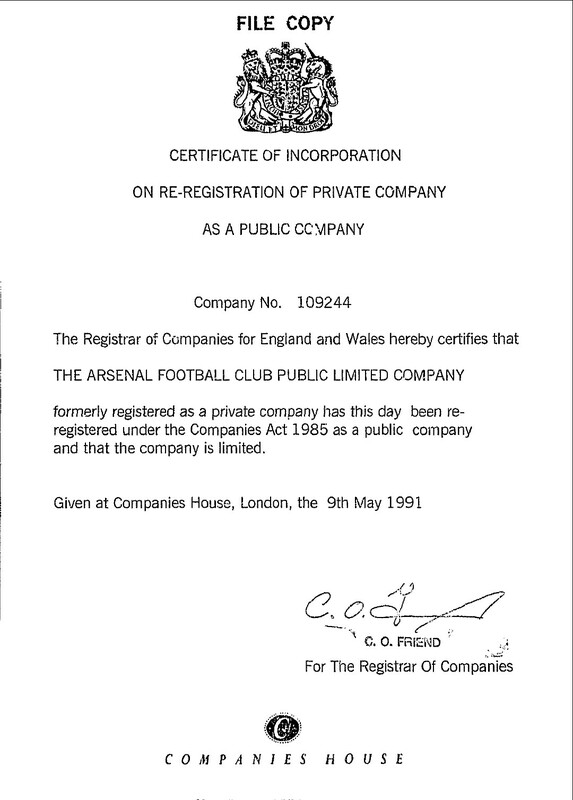 So since May 13, 1991, the official name has been The Arsenal Football Club Public Limited Company. On this certificate it appears the ‘The’ has been included quite deliberately as part of the name. Therefore in answer to the question, when did ‘The Arsenal’ change to just ‘Arsenal’, quite simply it didn’t. It’s been ‘The Arsenal’ since 1915. 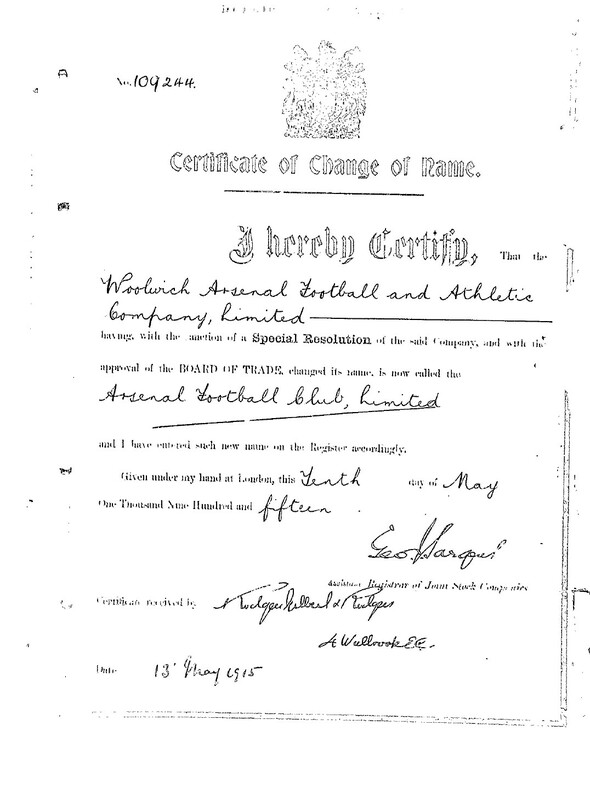 As I say, the 1915 name change documents seem to indicate that there was no deliberate decision to call the club ‘The Arsenal’, and I suspect that this form of the official name was a happy accident that the club were content to continue when reregistering in 1991. But the official name is one thing, and everyday usage and what fans say is another. It’s clear from club publications that they dropped ‘Woolwich’ almost a year before an official change, and then used other variants of the name over the years. My own theory is that fans and the media latched onto ‘The Arsenal’ more easily because they’d been used to having something in front of the name and it sounded more natural than a single word on its own, and the non-geographical nature of the name also helps and is very rare in English football. Also ‘the Arsenal’ was a physical entity in Woolwich. I have no doubt that ‘The Arsenal’ was used as a fans’ name for the club long before they left Woolwich. Similarly, there was ‘The Wanderers’, and also ‘The Wednesday’, who went the other way and added the geographical part later, and clubs like Blackburn have always been known as ‘The Rovers’ and West Brom as ‘The Albion’ to their own fans, and originally in the media. There’s a story that Herbert Chapman decided to stop using the ‘The’ so that Arsenal would appear alphabetically first among English clubs, but this isn’t true. Firstly both Accrington Stanley and Aldershot were around in Chapman’s time – admittedly Aldershot only started in the Southern League in 1927 and the Football League in 1932, but Accrington were in the league from 1921. Secondly, who would ever put ‘The Arsenal’ under T alphabetically? Would you list ‘The Prudential’ or ‘The Co-Operative’ under T? It would be daft. Thirdly, in the book of Chapman’s collected newspaper columns, ‘Herbert Chapman On Football’, he makes reference to ‘The Arsenal’, so there is nothing to suggest he was against it in conversation. So I think this story just came about as part of the myth of Herb, who did of course make far bigger and more important changes to the club and to football in general. I think the club probably stopped using ‘The’ formally to appear more modern, and this happened before Herb arrived on the scene. Arsenal historian Andy Kelly (@Gooner_AK – visit his Arsenal History website at TheArsenalHistory.com ) has found from digging around the company check website that nearly all clubs used to officially have ‘The’ in front of their names, a throwback to when they were incorporated and the ‘The’ was part of the printed form. However, more recently – when they re-incorporated as PLCs? – most of the others dropped ‘The’ from their names while Arsenal chose to retain it. Finally, the documents at Companies’ House include this list of subscribers appended to the Articles of Association from 1910. I wonder how many shareholders now describe themselves as ‘Licensed Victualler’ or simply ‘Gentleman’? PS: Since I wrote this, Andy Kelly and Mark Andrews have started their Arsenal History blog and have gone into the subject of Arsenal’s name changes over the years in much greater depth and with more original research than I did. They’ve used (with my permission) some of the documentation reproduced above, but have also looked at newspaper reports from the era as well as official club publications. Their series of posts on the subject can be found here. Chants and songs use whatever scans best. Some have Ars-e-nal with three syllables, some have Ars-nul with two, and some have ‘the’ in front, depending where the stress needs to be in the word or phrase. GREAT to know about these facts !